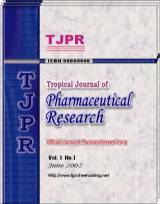 The Tropical Journal of Pharmaceutical Research is an online international journal allowing access to abstracts and full-text. The journal is devoted to the promotion of pharmaceutical sciences and related disciplines (including biotechnology, cell and molecular biology, medical and other life sciences, and related engineering fields). It seeks to foster multi-disciplinary research and collaboration among scientists, pharmaceutical industries and healthcare sector as well as provide an international forum for the communication and evaluation of data, methods and opinions in pharmaceutical sciences and related disciplines. The publishers welcome contributions of tropical relevance.